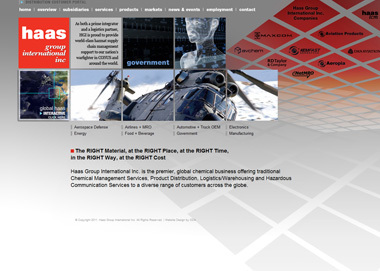 DDA designed this interactive website for Haas Group International in 2011. The website reflects the wide variety of chemical distribution and management services that the conglomerate's various subsidiaries provide. Each service category is represented by a rotating presentation of images that represent each of the industries served by Haas Group International. The website also includes an innovative grid design in the background which links to individual pages describing each subsidiary, including links to each of their corresponding websites. An interactive map on the website allows users to see the global reach of Haas Group International by identifying the many locations the company is found worldwide. By building a website with such an original, cutting-edge design, DDA ensured that Haas Group International presents an image of itself online that is every bit as groundbreaking as the company itself.